About 65-140 million years ago during the Cretaceous period, the age of the super continents Pangaea and Gondwana, central Australia was covered by a giant inland sea. Dinosaurs were the major fauna of the earth at this time; opalised fossil remains of dinosaurs are a legacy of this period. As the inland sea retreated, silica rich sands were deposited, onto what is now basically a desert area. Weather conditions changed the sand sediments released large quantities of soluble silica, creating a silica gel. The silica gel seeped down through the sedimentary structure of the area, into its cracks and crevices, gradually hardening through natures heating and moulding processes, resulting in the creation of opal. 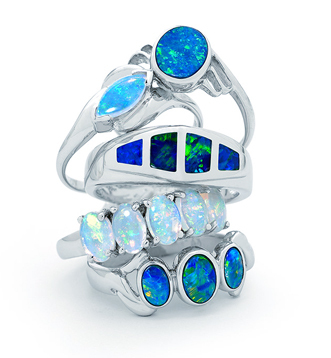 Due to the mineral content of the host rocks in which the hardening process occurred, which affects the body tone of the opal; different types of opal were formed.